Posted on June 25, 2018 at 1:16 pm. 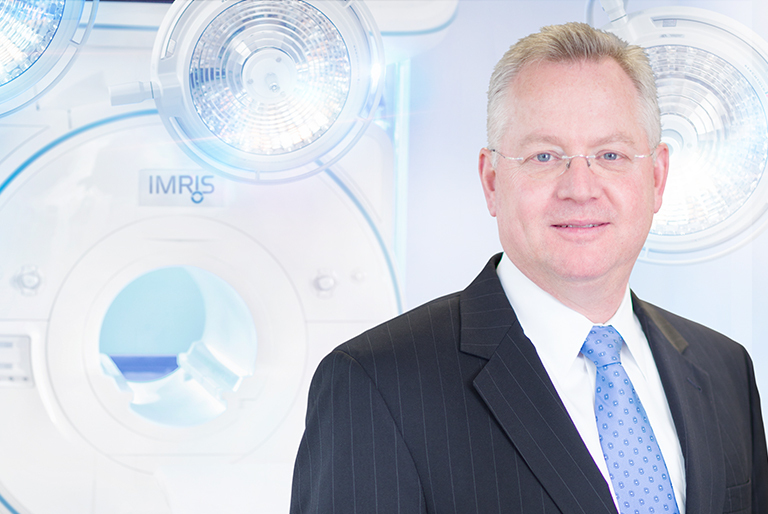 Peter Simpson, a leading medical innovator, has joined IMRIS as Senior Vice President of Research and Development. For a quick recap of his career and a description of Simpson’s new role, see A Leading Industry Innovator Joins IMRIS R&D. After developing and launching technologies at the world’s leading innovators – from start-up shops in the heart of Silicon Valley to major healthcare providers in China, India, Brazil and beyond – Peter Simpson is still driven by the reason he became an engineer in the first place: people. It began with a paradox, an unexpected lesson at Stanford University, where Simpson studied Mechanical Engineering and Product Design. There, he learned to begin with the end: to start with the needs of the end-user and work backwards – creating a product that doesn’t just function, but fundamentally changes the way people live. He had the fundamentals of a philosophy that would define his career, and in 1982, he brought his signature “human-first approach” to Silicon Valley, a region in the San Francisco Bay area that was just beginning to emerge as the technological boomtown it would later become. It worked; but it forced Simpson to adapt, in the process. The pressure chamber of small, fast-paced start-ups pushed him to adopt a new mentality toward product development: to be system-minded, rather than just product-minded. As he honed his leadership skills and discovered opportunities in emerging markets, that experience took Simpson far beyond the Valley. For many successful, respected engineering careers, Silicon Valley is the peak. For Simpson, it was more a launch pad. After departing the Valley, Simpson joined a product-development firm in Chicago. For more than a decade, he created products for a vast array of industries: designing, developing, and launching consumer goods for companies like PepsiCo, crafting high-speed innovations for aerospace clients, mastering the product-development process, working at the speed of a Silicon start-up under the expectations of a global company, perfecting his leadership skills, tackling a constant stream of challenges, opportunities and surprises – and, along the way, modifying his approach while holding steadfast to his core philosophy. During that decade of innovation, Simpson explored product development in many industries – with products that couldn’t be more different. Still, as he worked through nuanced challenges and discovered familiar patterns along the way, Simpson found a common thread that ties together all product-development projects – from soft drinks to spacecraft. “It’s always about the end-user. Every industry has its particular products, but the successful ones are always driven, first and foremost, by what the user needs,” says Simpson, who helped the Chicago development firm grow from 180 employees to more than 400. In the mid-2000’s, that user-centric mentality brought Simpson to the forefront of global healthcare, where he discovered an industry where human-first innovation is always in high demand. A fundamental rule of product development is that functionality alone is never enough. A product can’t just work; it has to be something people will use. As Simpson developed products for major healthcare providers across the globe – everything from dialysis machines and infusion pumps to sleep apnea-treatment devices and imaging modalities – the needs of the end-user always drove the design. At Philips, Simpson led R&D for the X-Ray business unit in Germany and the MR Advanced Clinical Solutions Team in the United States – using the ‘human side of design’ to influence every product, from the macro “big ideas” to the micro details. Before he ever considered the technical side of the imaging modalities, Simpson would audit the patients and radiologists who depend on the systems, using their feedback to inform every element of product design. The result was effective technological innovation that improved outcomes in hospitals all over the world. With success in X-Ray and MRI, Simpson’s career was becoming increasingly focused on imaging modalities. Meanwhile, “intraoperative imaging” was emerging as the future of the industry. Intraoperative imaging brings imaging modalities – like MRI, CT and Angio – into the surgical environment, creating a “hybrid” surgical theatre. This empowers surgeons to obtain real-time images of their patient mid-operation, offering an ‘inside look” that, until recently, was impossible. For patients, that means better outcomes and the opportunity for new, minimally invasive procedures. Simpson saw the potential of intraoperative imaging. The hybrid OR was the OR of the future. And, at the forefront of the industry, there was IMRIS, the global leader of intraoperative imaging and hybrid surgical theatre design. In IMRIS, Simpson saw a unique opportunity: a team with the potential of a global leader and the energy of a Silicon Valley start-up, reminiscent of the companies that launched a young engineer’s career in 1982. Today, Simpson has joined IMRIS as the Vice President of Research and Development, where he’s channeling his human-first, system-minded approach into industry-leading innovation. Simpson’s aspirations are groundbreaking at a global scale: He plans to use every lesson he learned from decades of product development to lead IMRIS down bold new roads – as both an innovator and a leader, creator and aggregator, a company that brings together disparate technologies into cohesive systems centered on the human experience. Still, for Simpson, who always considers the people impacted by his work, R&D is always personal.